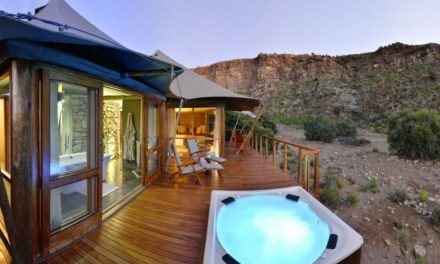 In the heart of the Klein Karoo, a scenic three and a half hour drive from Cape Town International Airport, along the famous Route 62 tourist route, a 58 000 hectare game reserve lay in wait, begging to be explored. As I entered the main gate I was rewarded with expansive views of vast open plains where Cape Mountain zebra grazed peacefully, the sparse landscape was dotted with indigenous flora, and my eyes were drawn to an alluring backdrop of the magnificently sculpted Warmwaterberge mountain range. This was it; Sanbona Wildlife Reserve. Sanbona Wildlife Reserve had been on my bucket list of places to visit for many years so when I recently was offered the opportunity to spend some time on the reserve I didn’t hesitate to accept. After entering the reserve through the main gate, it was a short 10km drive to the “Welcome Lounge” where we would leave our vehicle and be transferred to Gondwana Lodge, one of three luxury accommodation venues within the reserve. Gondwana Family Lodge, Tilney Manor, and DWYKA Tented Camp. The 45-minute transfer allowed us time to drink in the sheer, stark beauty of the reserves’ rugged landscape. The ground was parched due to the ongoing drought being experienced in the Western Cape yet both fauna and flora was somehow managing to survive these harsh and unforgiving conditions and still exuded a natural beauty found nowhere else in the country. Gondwana Family Lodge has a traditional Old Cape Dutch architecture style air about it with thatched roofs and large veranda’s attached to the reception, lounge and dining areas offering guests various sun-drenched nooks from which to soak up the warming winter sun after the morning’s game activity. Offering an outdoor play area, child-friendly swimming pool and a special “Kids on Safari” programme, Gondwana Family Lodge is perfect for groups of friends or families to come and enjoy a luxury bush experience.